I was doing ok when the snow fell and the Christmas music started playing, and even managed to keep my enthusiasm on the down low while I decorated my place and started putting my Christmas shoeboxes together, buuuuuut then my parents decided to put up all their decorations while I was visiting them this past weekend, and that was basically the straw that broke the camel’s back – I’m in full-on Christmas mode over here. That being said, I’m not really going to chat your ear(s) off about Christmas [just yet], other than to say that I probably won’t be sharing any Thanksgiving/pumpkin/fall themed recipes this week. … which, if you ask me, never goes out of style. These no bake brownie batter truffles are based off my bake brownie bites, only I tweaked the original recipe a bit by reducing the sweetener and adding more chocolate instead. 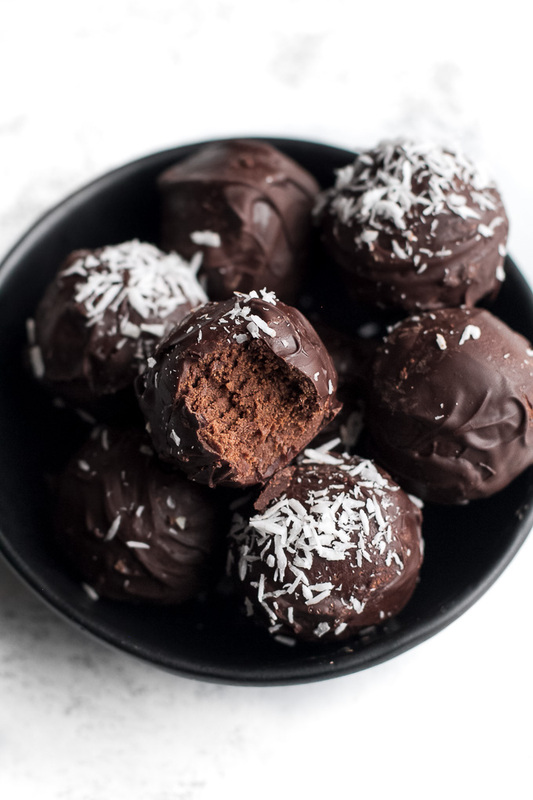 The result is a batch of healthy chocolate truffles that have a super soft and fudgy centre (kind of like those two-bite soft baked brownies) surrounded by a slightly crisp chocolate shell. 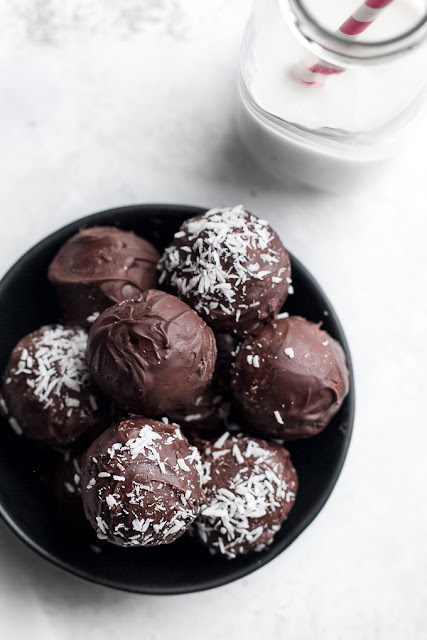 They’re gluten-free, grain-free, vegan, and pack a nice little protein punch thanks to the addition of protein powder. You only need 7 simple ingredients to make them, plus either a food processor or a spoon and a decently strong arm And I guess either a microwave and stove to melt chocolate with… because after they’re all mixed up and rolled into balls, they have a quick little romp in some molten cocoa-ness (I used 70% dark), followed by a brief stint in the fridge to harden up. And voila! 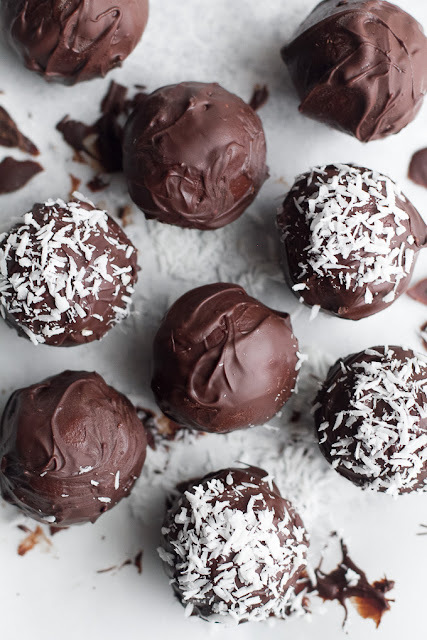 Some healthy truffles to satisfy those chocolate cravings. Add all the ingredients to the bowl of a food processor or blender and process on high until they have fully combined to form a dough. Depending on the ingredients you used, you may need to add a splash of extra milk or a small sprinkle of coconut flour to get the right consistency. The mixture should stick together easily when pressed without being overly sticky. Using a heaping tablespoon, roll the dough between your hands to form individual balls. Set them aside on a large plate lined with parchment paper, and repeat with the remaining dough. * I used a brown rice protein to make these vegan, but feel free to use whichever protein is your favourite. Just note that different types of powders absorb liquid differently, so you might have to adjust how much milk you add depending on which kind you use. ** You can also use honey if not strictly vegan. 0 Response to "Brownie Batter Truffles"